When buying a luxury car, you expect the best equipment and driving experience. Infiniti and Bose are partnering together to create a special edition of the popular Infiniti Q50 that will have the ultimate sound experience for discerning car buyers. Named the Q50 Sound Studio by Bose, this edition is set to be officially revealed at the Frankfurt Motor Show. This Infiniti will have a complex 14-speaker audio system from the premium audio equipment manufacturer, in addition to a DAB receiver and GPS navigation. The Bose sound system has been custom designed for the Infiniti Q50 and its interior dynamics, and this model will be the first to be equipped with Bose’s Advanced Staging Technology. This cutting-edge sound technology is expected to deliver a sound experience like you would expect with front seats at a concert hall. 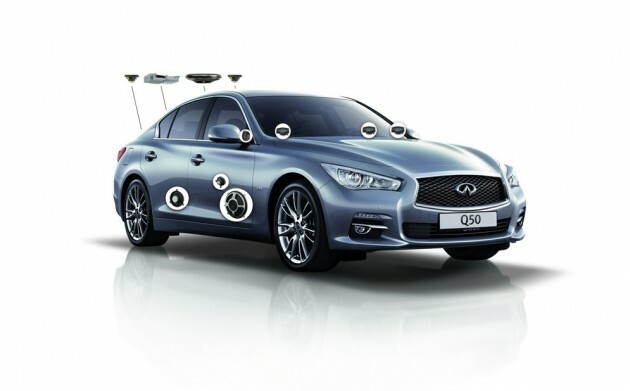 The Infiniti Q50 Sound Studio by Bose will also be equipped with Bose AudioPilot®2 Noise Compensation Technology to ensure that the music can always be heard over road noise outside of the car. Active Sound Management Technology will also work to help reduce sounds from the powertrain while making sure you can still hear the powerful engine. If all goes according to plan, the Infiniti Q50 Sound Studio by Bose should be in dealerships in October of this year. This will be a limited edition, so interested buyers should keep their eyes open to make sure they get their hands on this musical experience on wheels.